Sitting in my fridge, nestled next to the Mint Slices, are a lovely wedge of Machego and a ceramic pot full of stinky Stilton. I had all intentions of tasting them and blogging about their fabulosity this past week and a bit, but life and a bout of the flu got in the way. They will remain in the fridge for another few days as today I have decided to write about a cheese that changed my idea of what a cheese actually was. And this post is also a tribute to a little country that is close to my heart and again finds itself on the precipice of chaos. I discovered labne on my first trip to Lebanon in 2001. It’s a ridiculously simple cheese, basically it’s yoghurt that has been strained through muslin and fashioned into balls. It can also be served creamy like a more set yoghurt – which I recently tried instead of sour cream with smoked salmon. A winner on all counts. It can be served for breakfast or part of the famous mezze, accompanied by pita bread and pickled vegetables. 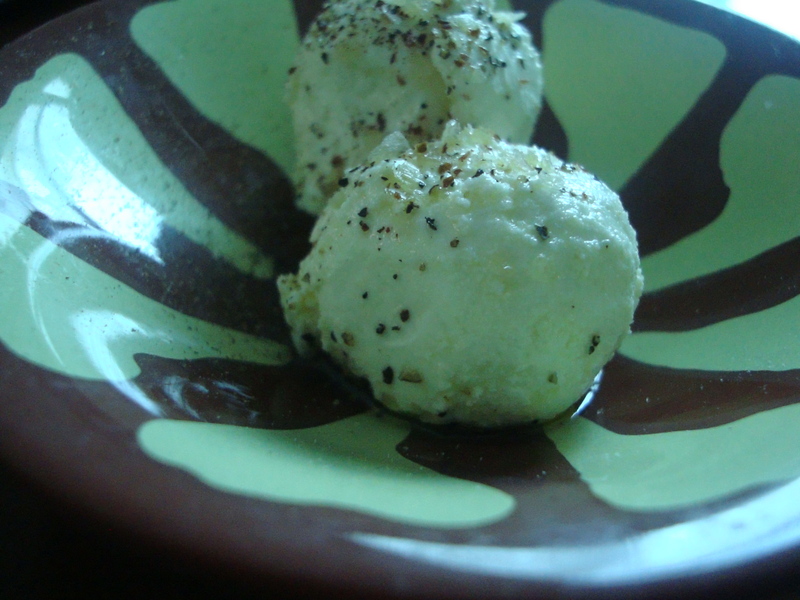 You can have these balls with sesame seeds, or rolled in herbs like zaatar (oregano essentially) or in olive oil. I picked up my labne today from a local supermarket, they were swimming like little balls of goodness in olive oil and for four balls, cost less than $2. To perk them up I sprinkled some salt, pepper and sumac, another Middle Eastern spice and ate it with warm pita bread. I have made my own labne balls, using a new Chux superwipe instead of muslin to drain the greek-style yoghurt. I am nothing if not versatile. One tradition that will live with me long after I leave the Middle East is their breakfast – lane, some chopped tomatoes, maybe some olives and cucumbers served with pita bread. The perfect heart starter served with strong coffee. Another version is shanklish, which tends to be aged slightly, rolled in zaatar and resembles an old tennis ball. It is also crumbly and makes for a fabulous salad. So back to Lebanon, I am not one to mix cheese and politics, I leave that to the French. Labne belongs to many country, even Greece, and is made with al forms of milk (goat, sheep and even camel) in the Middle East. But it was in Lebanon that I discovered it’s creamy and tangy consistency. Not quite as sharp as feta. My affection for the country and its inhabitants is well known. It’s a country and a people with an amazing will to enjoy life regardless of its circumstances. That, to me, is enviable. Lebanon gave us many things – writer Khalil Gebran, the cedar tree and Mika (OK, let’s think about that last one), but it also gave us a stunningly rich culinary and cultural tradition. I’d rather it be remembered for that.